So, I kicked back and resigned myself to the idea that this was a rebuilding year. That the goal of this season was to develop talent—develop role players—who would complement the star studded recruiting class coming in next season. 2017-18: Rock n’ Role … er, maybe just Role? This Oregon team had some solid role players, but clearly lacked the go-to ”alpha dog.” Last year’s team had three go-to clutch performers, but this year, nada. 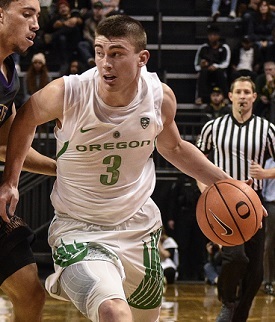 Payton Pritchard is a top-notch college point guard, but he’s a high-end complimentary player to the Dillon Brooks and Tyler Dorsey‘s of the world. He’s not the go-to guy who can carry a team. Too often this season he looked the part of Stockton-Malone without the Malone. Perhaps the closest thing Oregon had to an alpha dog (perhaps one in the making) was Kenny Wooten. 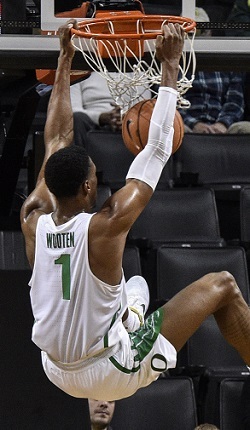 He’s not an offensive player, but a top-end defender and shot blocker (naturally thinking Jordan Bell here), who was the “go-to,” clutch player in the Ducks past two victories. No, he didn’t hit game-winners, he blocked the other team’s potential game-winners. But only so many times can you rely on opposing teams tossing up horrific, highly blockable, last-second prayers that get rejected into the 15th row. With his outstanding skill set and five-star pedigree, Troy Brown had the look of a potential alpha dog, but you never really know what you’re going to get from a true freshman. Brown, though he displayed flashes of brilliance and first round NBA talent at times, never really seemed to be in sync and struggled to find his outside shot. The ability to coolly knock down jump-shots in crunch time with ice in your veins is the most essential alpha-dog trait. With a full off-season under his belt and paired with next year’s freshman class, it would be fascinating to see what Brown could become if he were to stick around. He very well could become an even better version of Dillon Brooks, but chances are we’ll never know. Payton Pritchard pushing the ball up up court. This season goes down as Altman’s first true disappointment. Nobody was expecting a return to the Final Four, but it was reasonable to expect the Ducks to make it back to the tournament and maybe even win a game. After we learned early on that this team didn’t have “it,” most of us thought, per usual with Altman’s teams, that he’d get things figured out as the season went on. Though the Ducks progressed, it just wasn’t enough. It’s not because Altman didn’t get it figured out. I think he did, and what he figured out along with the rest of us was that he didn’t have the “dog” to lead a band of talented role players to the big dance. This team had no Jonathan Lloyd (2013 Pac-12 Tournament MVP), Joseph Young (2015 Pac-12 POY), and of course, the still fresh in our minds trifecta of Dillon Brooks, Tyler Dorsey and Jordan Bell. But, before we let our emotions get the best of us and start searching the likes of GoDaddy to see if URLs like firealtman.com are available (as of yesterday it was), let’s take a deep breath, relax and reflect fondly on what Altman has achieved in Eugene. Now, Ernie Kent did a lot of good things for Oregon basketball. I respect what he accomplished and how he took the program to a higher level. Having said that, he’s no Dana Altman. 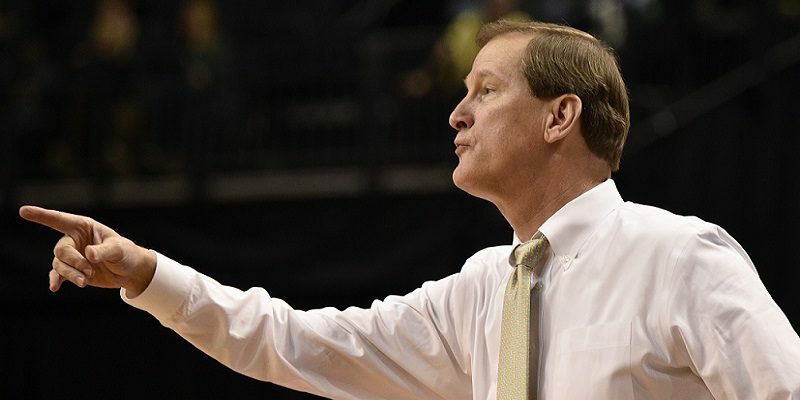 Yes, Altman benefits from the new arena (Ernie, in his day, benefited from the newly infused Nike money, football success and the traction of the ”Oregon brand”), but there’s very little doubt that he’s the superior coach. So, let’s compare their Oregon careers to this point. Can Dan Altman keep Troy Brown around with the idea of becoming “the dog”? 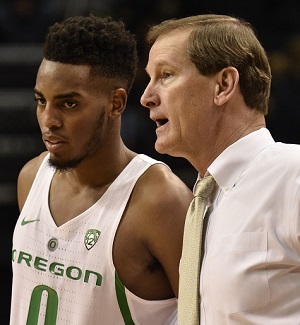 Altman has done more with less in his first eight years at Oregon by piecing together solid teams made up of diamonds in the rough, crafty transfers, the occasional stud recruit and player development. But for right now, those days are over. A top-level coach in a top-level facility coaching top-level talent. The gourmet ingredients have made their way into the kitchen. It’s now time to cook up a 30-win, Final Four team. And not with a group of backs-against-the-wall, hungry overachievers, but rather, players with first rate pedigrees. Will they be hungry? Will there be a “dog”? Will there be a hungry “dog”? And if the Ducks fail to have a canine in their midst next year, they will fail to wreak havoc in the NCAA tournament, and Duck fans will most assuredly let out a collective “DOG” GONE IT! Ok, probably something a whole helluva lot stronger and less cheesy than that.